I love family resemblances! Left: my maternal grandfather, George D. Hankins (1898-1974), whom I knew. 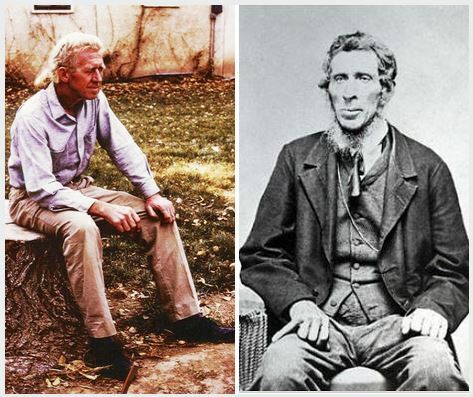 Right: a newly-discovered photo of his great-grandfather (my 3rd great-grandfather), Jacob J. Keysling (1789-1855). Note the similarities in face, build, pose, hands (clenched), and hair. What a great find! If you think pedigree charts are just for royalty, dogs, and horses, think again! Family history research can be so rewarding! Are you curious about your roots? Want to preserve your family photos and stories? Is there a family legend you’d like to prove…or disprove? Wondering how your ancestors lived…and died? Want to teach your children about history in a personal way? Interested to experience why genealogy is America’s #2 hobby? Let’s get started on YOUR family tree! My paternal grandparents Archie Raymond THORNTON & Hazel Islery CLAY on their wedding day in 1925. For $299 (plus tax in NM) I will build your pedigree chart for you, branch by branch! Read The Gift of an Organized Family Tree for details on how this package works and what it includes. Click here to schedule a FREE 20-minute phone strategy session. Or contact me via email. We’ll discuss your project and determine your goals and best path forward. Want to DIY, with a little help? If you prefer to do your own research, but want a little help with organizing and how-to, see “How can you help me DIY?” below. Read Puzzling Out Your Family History to learn the pleasures and pitfalls of doing genealogy research. Virtual/remote coaching sessions are $85/hr. (plus tax in NM). Q: What the heck does genealogy have to do with organizing? A: Notes. Data. Documents. Vital records. Photos. Stories. Keepsakes. Research materials and supplies. Desk and storage space. Paper and computer files. It all needs to be organized to make sense of your family history, to preserve it, and to share it with your family! This is just one part of Organizing For Your Legacy. Q: What is your genealogy research experience? Are you a Certified Professional Genealogist? A: I am not certified. At least not yet. I do have 20 years of old-school (and modern) research experience which includes having attended several genealogy conferences and taken a number of genealogy classes. I have been a Professional Organizer since 2004 and a Certified Personal Photo Organizer since 2015. Q: Can’t I just go online these days and find my family tree? A: Yes and No. I grew up a non-Mormon in Boise, Idaho which has the highest percentage of Mormons outside of Utah. With their emphasis on family history I grew up under the misconception that all I had to do is to travel to Salt Lake City and ask the Mormons to literally hand me my family tree. Ha ha — not so! Fortunately, before I ever visited (multiple times) I realized that what they have at the Family History Center in Salt Lake City (as well as at all local LDS Family History Centers) is records. Lots and lots of records. Or, as I like to call them, puzzle pieces. It was still up to me to find the pertinent puzzle pieces, and to assemble them correctly. In recent years a plethora of records have been digitized and uploaded to the internet. But not all records are, by any means, available online. I know this because I know it, but also because I’m participating in a current project to transcribe all North American marriage records. Oh, the pressure of correctly desciphering antiquated and sloppy handwriting! I love Ancestry.com, and have been busily comparing notes with my new-found DNA cousins. But along with the ease of doing digital research in the comfort of your own home comes the ease of making big-time errors. You might, indeed, be related to Charlemagne. Or, maybe someone else did shoddy research and it was copied verbatim by enough other researchers that you think it must be true. I’m not saying you have to follow the same old-school path I did, but I am grateful for the hours spent poring over census records on microfiche; reading ancestors’ biographies in county history books in research libraries; driving around the countryside hunting for unmarked family burial grounds; and visiting the places where my ancestors lived. There’s nothing like seeing the old family homestead, or blowing the dust off an old marriage record book you just found in the basement of a small town City Hall, to make your ancestors come alive. Q: Will you for sure be able to help me? A: Ha ha ha — no, not for sure! There are so many areas of research that no one (even a certified pro) can be an expert in all of them. I am most familiar with the time frames and locations of my own ancestors, of course — 1900’s CA/NM, 1800’s IN/OH/IA/TN/KY, 1700’s Quakers NC/SC, etc. But basic research skills apply to all areas, and I do guarantee that I will be able to find something of interest to you or your money back. Sometimes even knowing that a particular line of inquiry is a dead-end is valuable information to a genealogist. I have one Hispanic client who is an adoptee. She wants to learn more about her Mexican birth family. She even has the names of her birth parents and grandparents. Can I find them? No-o-o! Why not? I don’t know, but here are some possible reasons: The information we have is inaccurate. They are off the grid in terms of documentation. There is something about researching Mexican records that I don’t know or understand yet. Solution: I did not charge her, and instead referred her to the National Hispanic Cultural Center here in Albuquerque for further help. Q: What will I get for my $299? A: It depends. 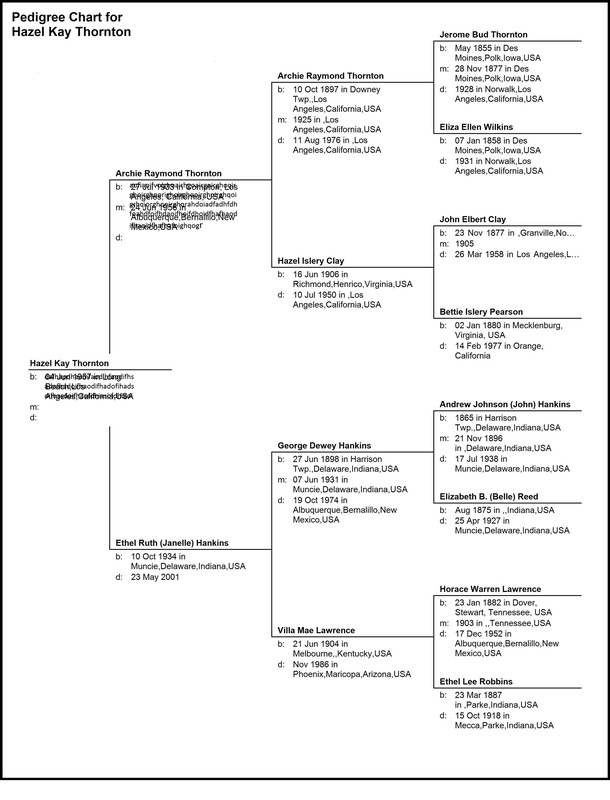 My goal for you is a 4-Generation Pedigree Chart, such as the one shown above, with supporting documentation. (You, your 2 parents, your 4 grandparents, and your 8 great-grandparents.) But it depends on where we are starting, how much you already know about your family history, and whether the records we need are readily accessible to me online. Needless to say there will be no traveling involved at that price! I will, however, point you in the right direction should you be so inclined to pursue records that must be requested by mail, or can only be viewed in person, on location. Essentially what you are getting is a few hours of my online research time; a few more hours of putting it all together for you; my research experience; my organizational skills; and my access to records that you may not have, or may not want to pay for. Read The Gift of an Organized Family Tree to learn more about how it works and what is included. Q: How can you help me DIY? Q: Do I need to purchase genealogy software? A. No, not for this pedigree package. The research results I will give you will stand on their own. People have been using paper records for centuries! A program such as Family Tree Maker or Roots Magic is nice, though, and invaluable if you want to pursue more research on your own, which I can coach you in doing (in person or virtually/remotely). An Ancestry.com account is also a lot of fun, but it is for researching and sharing, not for primary storage of your records. We will discuss how to back up your information and how to continue your research, if desired.